The preheader is the first line of machine-readable content that exists in your email, and it’s what most email clients show right next (or right below) the subject. Because of its placement in the inbox, it carries a lot of weight in a recipient’s decision to open the message or not, and should therefore be an enticing summary of what the email is about. 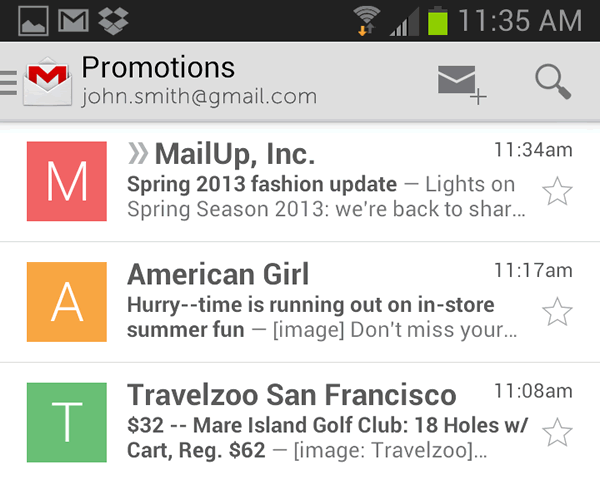 Here’s a Gmail inbox on a mobile device: the preheader is the text in light gray shown after the message subject. 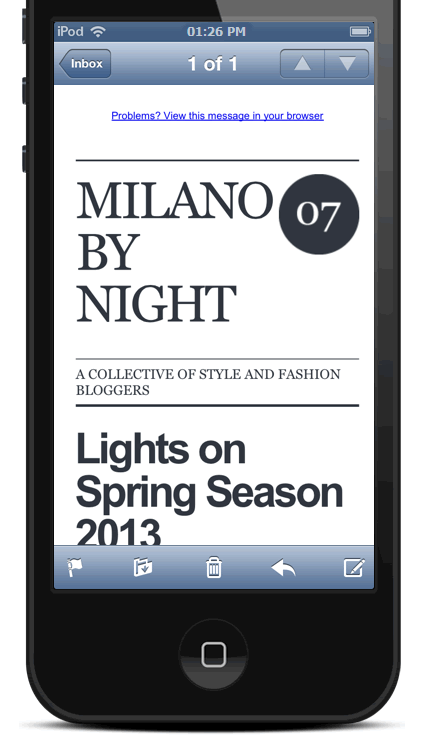 In this article we’ll look at what you can do to optimize the preheader, focusing mostly on mobile email clients. On a mobile device – which is increasingly where email opens happen – speed-reading users glance at their inbox and click only on the messages that grab their attention. That link, which typically says something like “Display problems? Click here” (or alike,) is definitely not what you want to display next to the subject, since it provides no information on what the message is about. As you can see, the first message shows a much more descriptive preheader, cut off at around 45 characters (with spaces). In the case of the second message, instead, the email client found the “Please see the Web version…” link as the first machine-readable text, and therefore showed that specific copy, which does not help the reader learn more about the message. Links or summary at the top? Two conflicting needs? You need the message preview displayed by the email client (sender + subject + preheader) to be as effective as possible in order to drive the highest open rate. You might very well need the first machine-readable text shown in the message to be something other than a great summary of the email. For example, the link to the browser version, or maybe navigation links to key areas of your Web site (e.g. an email sent by an ecommerce merchant), or perhaps an image (some email clients will put “[image]” in the preheader in that scenario). Fortunately, a tiny bit of HTML code comes to the rescue, allowing you to add a preheader to the message that is hidden when the message is opened. The best of both worlds! The style says to hide the DIV when the message is shown. Geek notes: the “important” declaration helps with Gmail, and the “mso-hide:all” one makes Outlook behave nicely. The style is ignored by the email client when it searches for the first machine-readable line of text, which means that the text included in the DIV will be displayed. In our tests, Outlook.com didn’t display the preheader included in the hidden DIV. No worries, though. Outlook.com likes to use the first line it finds in the TXT version of the message. This means that if you can edit the plain text version of the message and place a summary at the top, you are all set. This is indeed something that you can do in MailUp 8.2.4 and above, where you can manually edit the plain text version of the message using a new tool that is part of the “Check Up” feature. In previous versions (or if you don’t manually edit the text version), the plain text version was created automatically from the HTML. Note that only relying on the TXT version of the message is not enough. Gmail, for example, does not grab the preheader from it, but rather from the first machine-readable line in the HTML of the message. Although in this article we are focusing mostly on the importance and the display of the message preheader in mobile email clients, please note that the preheader is used in desktop and Web clients too, and it’s extremely important there as well. Here’s an example of the preheader shown in the message preview by the desktop version of Outlook 2010. Email clients typically display the first few dozen characters (including spaces) in the pre-header. This depends on the email client, on the phone orientation, on the length of the subject (e.g. Gmail), etc. The point is that the juicy stuff should come first. The preheader should always be consistent with the content of the message: never “trick” readers into opening a message by using a misleading preheader. 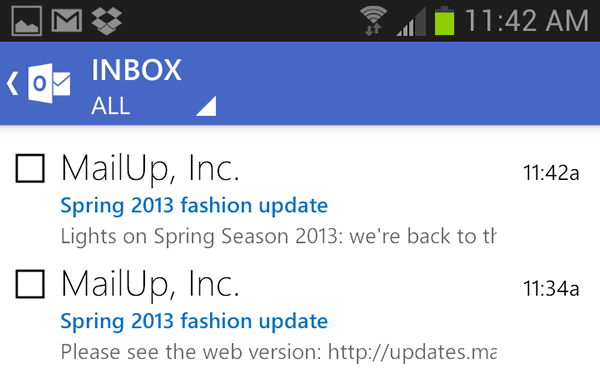 When you view the message in your email editor, the preheader DIV will likely not be shown. So, if you create a new message by making a copy of an old one, remember to change the preheader! Happy emailing… and let us know if you encounter any issues with the HTML code we included above.